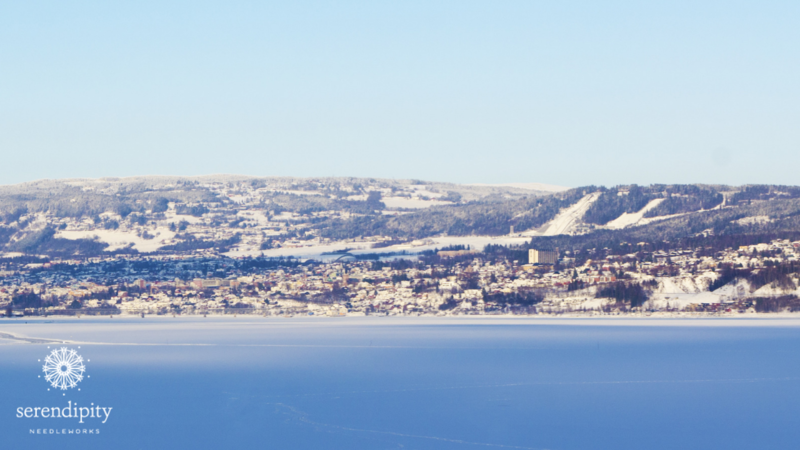 Lillehammer – site of the 1994 Winter Olympics! 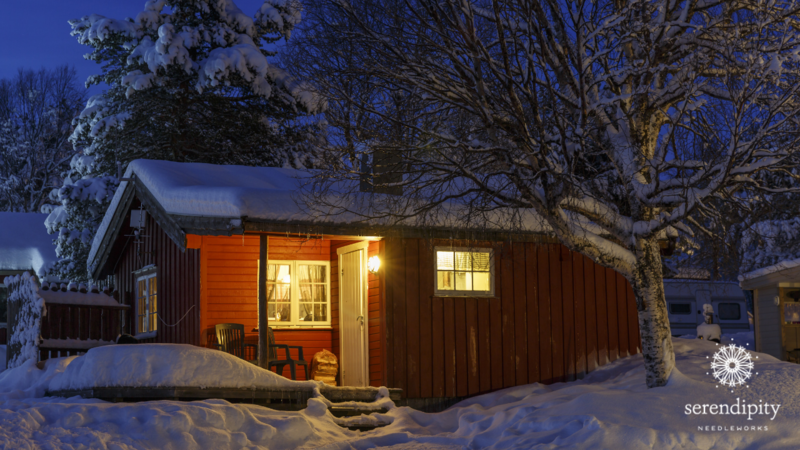 Lillehammer is in the heart of Norway and it overlooks the northern part of Lake Mjøsa and the Lågen River – both of which are frozen right now. Snowy mountains surround this picturesque city that’s home to fewer than 30,000 people. Wondering what we’re gonna explore here in Lillehammer? I thought you might be. 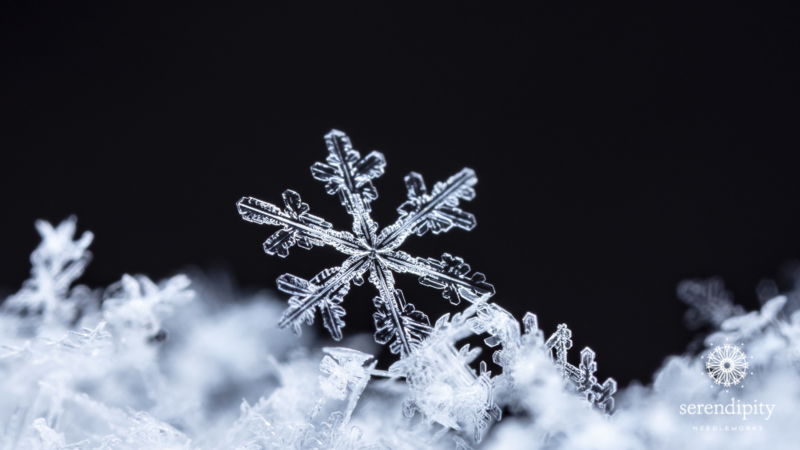 Did you know that the shape of a snowflake largely depends upon the temperature and humidity at which it forms? As the flake moves through different zones in the atmosphere, well – that’s when the complex structure develops. 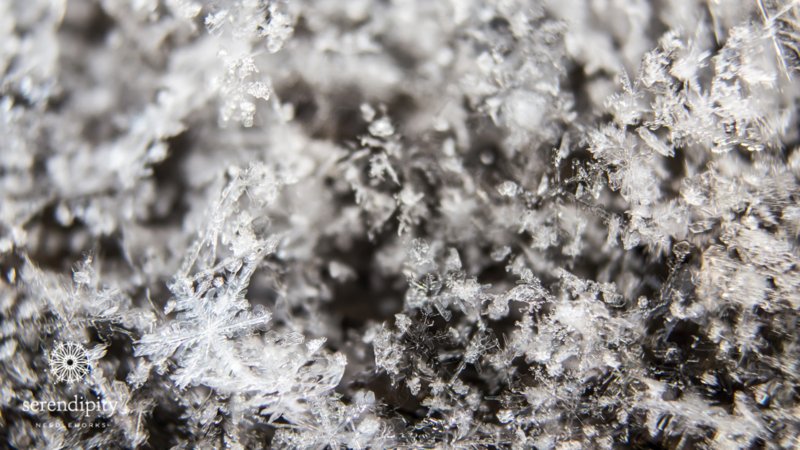 Snowflakes usually have six arms (or dendrites, as scientists call them) and that’s because ice has a hexagonal crystalline structure. The Daisy stitch is a terrific choice for individual snowflakes. It’s super easy to execute – work the stitches just like you see in the diagram below and you’ll be golden! It’s terrific for individual snowflakes that you might find on holiday canvases like “Candy Cane Snowman” by Pepperberry Designs. 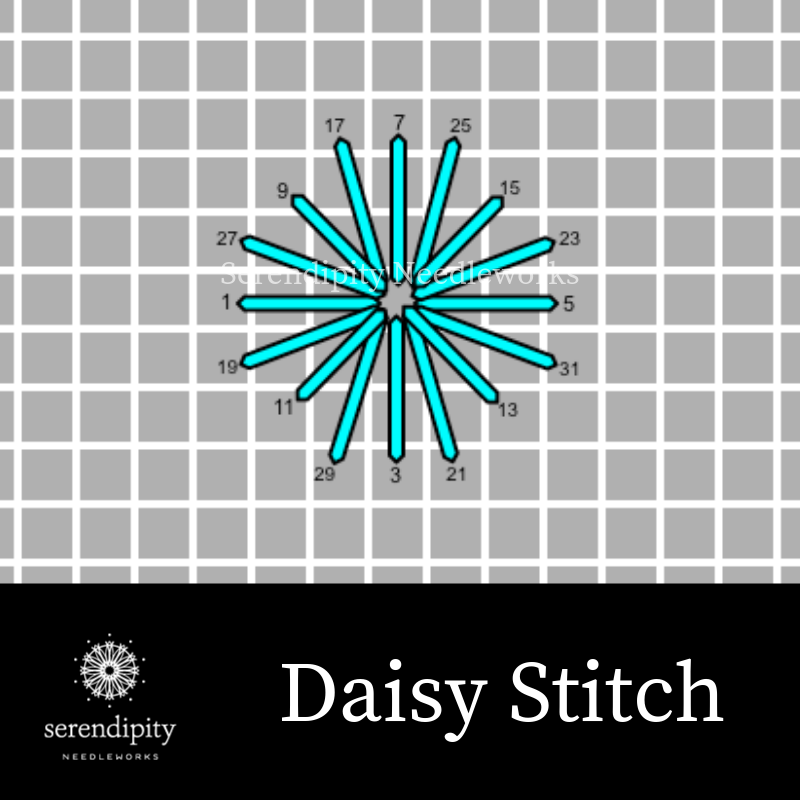 In fact, I’d stitch all of those little white dots with the daisy stitch. I’m using Nordic Gold to work the daisy stitch. Nordic Gold is a 52% metallic polyester/48% nylon chain construction thread. It’s stronger than blending filament and is one of the more pleasant metallic threads to work with. And speaking of blending filament, Nordic Gold is a very fine weight thread that is equivalent to 2 – 3 strands of blending filament. I recommend using Nordic Gold “as is” off the card. It’s not as prone to unraveling as some of the other metallic threads we’re using, but you’ll still probably want to treat the ends for fraying. Oh – and use pieces no longer than 18″. You could also use Petite Silk Lamé Braid for the daisy stitch. I’m using one strand of Nordic Gold (ND17) in a #22 tapestry needle to work my stitch sample on a piece of 18 mesh needlepoint canvas. If you want to practice the Daisy stitch with Petite Silk Lamé Braid (SP02) on a piece of 18 mesh canvas, thread one strand in your needle. And that, my friend, brings us to the end of our stay in Norway. It’s been so much fun sharing this fun stitch/thread combo with you. Until next week, happy stitching! PS: There are oodles of needlepoint canvases that feature snow and it can be hard to narrow down which stitches will look best. You can rest assured that all of the snowy stitches from weeks 5 and 6 will work on a variety of projects, but you might want to be able to choose your own stitch/thread combinations. Inside The Stitcher’s Club, I help you learn how to do just that! Enrollment will be opening soon, so if you’d like to learn more about it just click here.